Nations Economic Statistics - Choose a Flag! Which sustainability issue will pose the biggest threat over the next 10 years? Energy Futures and Urban Air Pollution- USA, China now Poland! - Will it ever end! Challenges cover a wide range of disciplines both industrial and academic. 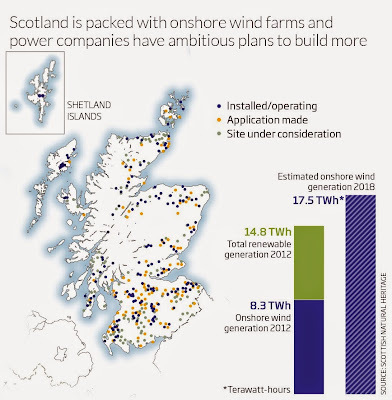 Wind power in Scotland - environment - From The New Scientist motivated arguably by "The Scots Independent Spirit and Renewable Energy Ambitions"
"Scotland is arguably one of the greenest countries in Europe. 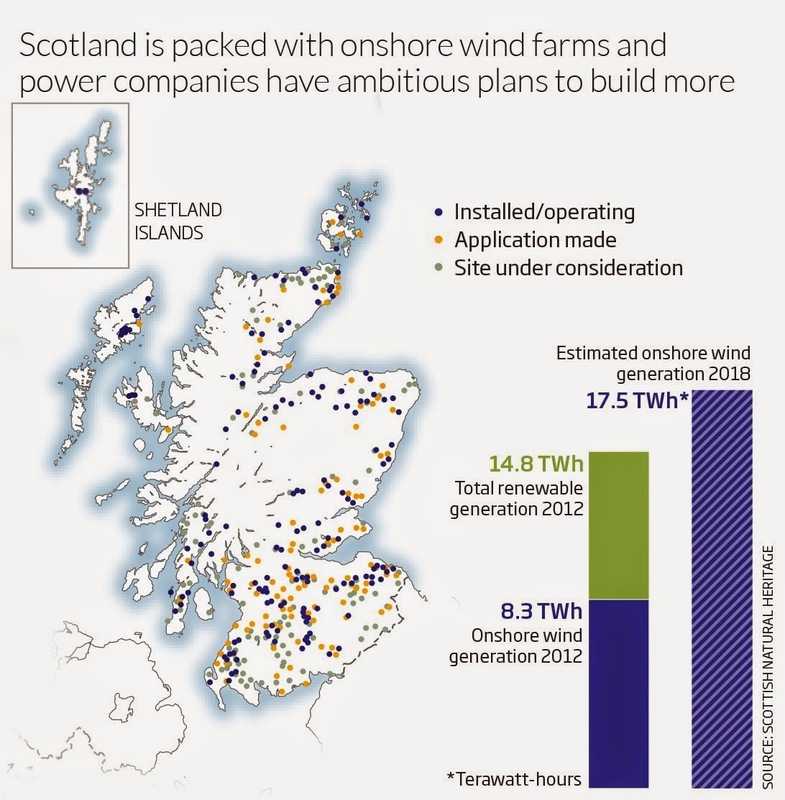 (notice the nuance) It produces 40 per cent of Scottish electricity demand from renewable sources, and models suggest this could rise to 67 per cent by 2018. That's closing in on the government's goal of producing enough green power to supply the equivalent of all of Scottish demand by 2020. According to the well known adage "A picture is worth a thousand words" allow me to bring to your attention the highly significant information on Wind Energy Installations and projects in Scotland here. I have taken a little of the sting from the article source in New Scientist since Scotland has, I am glad to say, opted to remain in the UK, at least as long as UK votes to stay in Europe. Leaving the current balance of payments in UK's favour it is ironical that "Southern-UK" cannot see its true role as a "Strong voice, critic if you will, and positive adviser" ever in Europe. and remain true to tradition as an island that helped enormously to keep Nazism and Fascism off its shores and kick extremism out of the EU. The experience of UK and Commonwealth could provide one model for the current troubled world of refugees seeking shelter "AT ALL COSTS". So come on lads play it fair. And what a performance from Scotland's Windy renewable energy programme. NEW Scientists full article Futures for Scotland still relevent! A pocket guide on a Europe 2020 initiative" is a well illustrated little guide with some important lessons and some solid statistical data on the benefits of innovation for crisis resolution and economic growth. However it may loose some punch by falling into the classical EU communication trap of announcing something for every one. cf point 10 below. While apparently pulling hard for the famous flat playing field, I for one would like to see EU innovating a relatively easy no competition ruling on cross border drug selling, namely tobacco, Standardise price across the EU based on the highest price currently used to prohibit this proven cancerous inducing highly costly practise. 1. 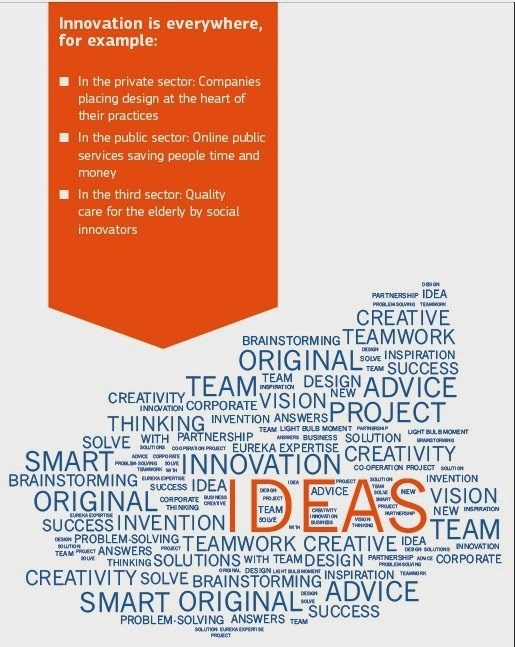 Why do we need an Innovation Union? 2. How is the European Union doing this? MAIN COMPETITORS - Innovation Union Scoreboard 2011. John Kao, “Innovation Nation” (2007). 5. Where & How_Innovation is everywhere, Examples are given. 6. 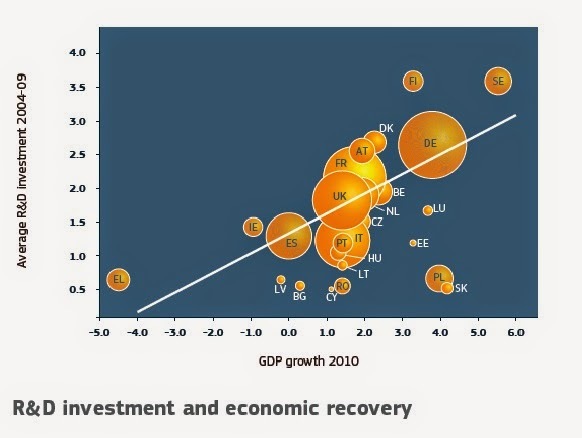 Best way to beat the crises_Innovate our way out.. Graph 1. 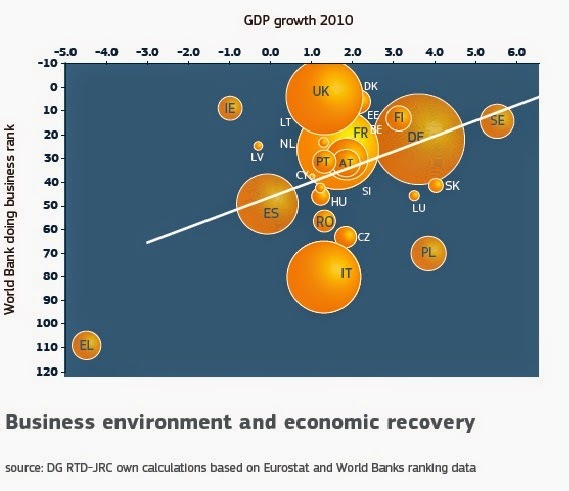 7. Business environment and economic recovery, Graph 2. Improving conditions and access to finance for research and innovation in Europe, we can ensure that innovative ideas can be turned into products and services that create growth & jobs. -Make Europe a world-class performer in science. Remove bottlenecks – create an internal market for skills, patents, venture capital, innovation procurement and standard setting to foster ideas being quickly implemented on the market. - Pretended Benefits for Citizens and public authorities. The initiative claims that it will make it easier for you to market your ideas and develop your company. The initiative will make it easier for you to conduct your research in Europe. For budding soccer players -goal scoring not to be missed! 2nd method: the curl by Eder, Nelinho, and Roberto Carlos with the outside of the soccer football boot is due to the Magnus effect. The effect is named after the scientist who first observed it in a laboratory in the 1850s. The Magnus effect explains the side-force on a sphere that is both rotating and moving forward. Here, we use it to analyze the World Cup™ match ball. List of Embodied Energy and CO2 equivalents for a wide range of materials. Short introduction and illustrative graphs. Phil. Trans A., RS London Conf. Proc. NOBEL PRIZE Prog 2011 & previous winners..